In addition to offering free texting to T-Mobile customers, another great complimentary service you can take advantage of this holiday season is location sharing through Glympse. Glympse has been a leading location sharing app for many years, and by adding their service to Gogo, they are now also the leading in-air location sharing service. Location sharing is simple – Through GPS, your aircraft knows where you are, and thanks to Gogo and Glympse, you can share that location with a select group of people. One of the biggest advantages of Glympse, is that it does not require you to sign up for an account, and the app is entirely free to use. 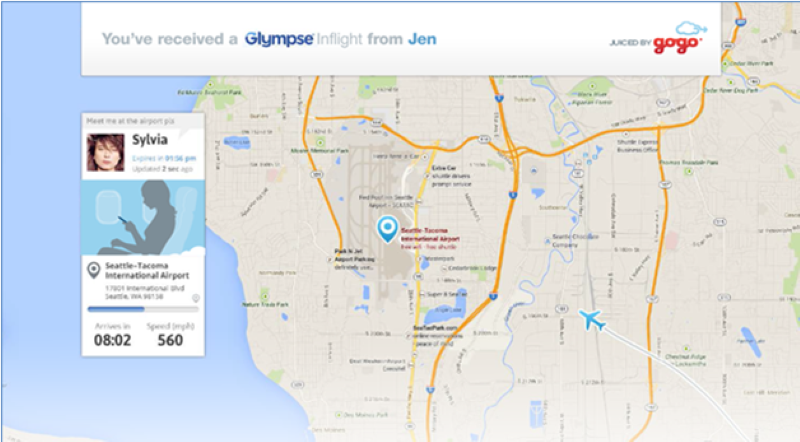 With Glympse on your phone, you can send your location to contacts by email, SMS, Twitter or Facebook. The message can go to just one person, a larger group, or even to the public using social media – you are always in control of who gets to see your location, for how long they get to follow you, and you always have the option to instantly stop sharing. Using the app is extremely simple – the first step is of course to install Glympse. The in-air enabled version is available for iOS and Android. To send a Glympse from the plane, you do not need a paid Gogo session. Connect to Gogo (search for the Gogoinflight Wi-Fi signal). Open the app and select who you want to send your Glympse to. The app is “location aware”, which means it automatically knows you are on a Gogo equipped flight. The recipient (on the ground, or another Gogo flight) will receive your Glympse, along with your flight information. Once sent, you do not need to keep the app open to allow the recipient to track you. This is perfect if you want to let friends, family or even a cab driver know when you’ll arrive at the airport. So, next time you are flying on Gogo equipped flight, make sure to download Glympse before take off, and send your location and flight information to your friends. You’ll see just how easy it is to use, and chances are the recipient of your will really appreciate the ability to track your plane. Happy travels!